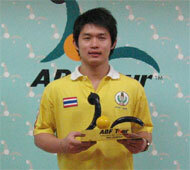 14th May, Bangkok: Local youngster, Somjed Kusonpithak and tour debutant, Kim Young Ju of Korea emerged as Men's and Women's champion of the ABF Tour Thailand 2007 leg just concluded at S.F. Strike Bowl at The Mall, Ngamwongwan. Somjed Kusonpithak, who earned a crack at the men's title after he outclassed Korea's Kim Young Jun, 210-156 in the first semi-finals, started the finals with a double strike and a 9-pin spare in the third frame had looked set to repeat the form he displayed earlier. An opened frame in the fourth unsetted the Thai when he could not find his strides with spares in the next three frames. But his fellow countrymen and challenger, Kritchawat Jamparkao also failed to find his rythmn opening the first frame and only managing a strike in the second and sparing the next three frames to trail Somjed. A strike in the eighth frame allowed the youngster to regain his composure and he went on to end the match with 187 while Kritchawat could not find a double strike to narrow the gap and only managing 185. The champion moved into the second round defeating Kuwait's Fadhel Al-Mousawi, 180-155 before knocking out UAE's Shaker Al-Hassan, 228-185 in the second round to reach the semi-finals. The runner-up edged Malaysia's Isaac Russel, 174-168 in round 1 and another Kuwaiti, Khalid Al-Dubyyan, 235-127 in round 2 to book his spot in the semi-finals. Meanwhile, Thailand was denied a double celebration when local favourite, Angkana Netrviseth lost to tour debutant, Kim Young Ju by just 1 pin in the women's deciding finals. The 19-year-old had an almost spotless game without any open frames and including a double strike in frames sixth and seventh. Despite starting off with a double strike by the Korean, a miss in the third frame allowed her opponent to draw level. But a strong double strike in the seventh and eighth frames pressured Angkana into just knocking down 6 pins in her final throw to end the match 202. 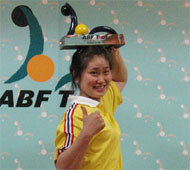 Needing only a strike in the tenth frame, Kim hit a perfect and solid strike sending her supporters cheering wildly. All she needed was to spare the bonus frame and with a cool composure, the Korean duly oblidged to finish with 203 and clinch the title. The champion had earlier knocked another Thai women, Soawapha Kunaksorn, 236-148 in the semi-finals while Angkana reached the finals edging Indonesia's Shalima Zalsha, 161-151 to confirm her spot in the finals. The ABF Tour Thailand leg was telecast LIVE over True Vision (Channel UBC) and the highlights will be televised later on local television stations of the eight countries where the tour is being held. Photos by Steve Chan, TND Group.